Auroshikha - Resin Gift Pack: From the memories of Trees! This package has 4 great resins that are of particular interest both for their fragrance and therapeutic properties, namely Frankincense, Myrrh, Gum Damar and Gum Benzoin. 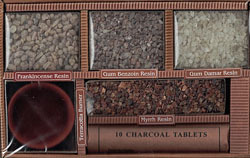 This box also contains a Terra Cotta resin burner, one roll of charcoal. This is a great way to try traditional incense. Each package of resins are 20g each. Make sure when using this kit, you insulate the Terra Cotta burner, it will get hot.